During the Second World War, she was involved in several major engagements, including battles in the North Sea and Merranean, earning her the most battle honours ever awarded to an individual ship in the Royal Navy. For this and other reasons Warspite gained the nickname the "Grand Old Lady" after a comment made by Admiral Sir Andrew Cunningham in 1943 while she was his flagship. In 1919, Warspite joined the 2nd Battle Squadron, part of the newly formed Atlantic Fleet, and undertook regular spring cruises to the Merranean. In 1924, she attended a Royal Fleet Review at Spithead, presided over by King George V. Later in the year, Warspite underwent a partial modernisation that altered her superstructure by trunking her two funnels into one, enhanced her armour protection with torpedo bulges, swapped the high-angle 3-inch guns with new 4-inch anti-aircraft guns, and removed half her torpedo tubes. After the process finished in 1926, Warspite assumed the role of flagship of the Commander-in-Chief and Second-in-Command, Merranean Fleet. In 1927, under the command of Captain James Somerville, she struck an uncharted rock in the Aegean and was ordered to return to Portsmouth for repairs. In 1930, Warspite rejoined the Atlantic Fleet. She was at sea when the crews of a number of warships mutinied at Invergordon in September 1931, although three sailors were later dismissed from the ship. In March 1933 she was rammed in fog by a Romanian passenger ship off Portugal, but did not require major repairs. After completion of the refit Warspite was recommissioned under the command of Captain Victor Crutchley. The intention was for her to become the flagship of Admiral Dudley Pound's Merranean Fleet, but trials revealed problems with propulsion machinery and steering, a legacy of Jutland, which continued to beset Warspite and delayed her departure. These delays and the work required to rectify them also affected the crew's leave arrangements and led to some sailors airing their views in national newspapers, angering Pound. Warspite finally entered Grand Harbour, in Malta, on 14 January 1938 and continued gunnery practice and training. At the end of one anti-aircraft exercise, a junior midshipman independently discharged his pom-pom gun after a towing aircraft flew low overhead to display its attached target to the crew. Warspite had turned towards Valletta on the exercise's conclusion and the shells hurtled towards the city. The shells landed harmlessly at a gunnery range where a platoon of the Green Howards was exercising. For the remainder of the year she cruised the Aegean, Adriatic and Merranean seas, leading an intensive series of fleet exercises in August due to rising international tension. She undertook another cruise of the western Merranean in the spring of 1939. In June 1939, Vice Admiral Andrew Cunningham replaced Dudley Pound and took Warspite to Istanbul for talks with the Turkish government. When war was declared in September the Merranean remained quiet and Warspite was recalled to join the Home Fleet following the loss of HMS Royal Oak. In April 1940, Warspite had started her voyage back to the Merranean when the Germans invaded Denmark and Norway; she rejoined the Home Fleet on 10 April and proceeded towards Narvik. On 13 April, Vice-Admiral William Whitworth hoisted his flag in Warspite and led nine destroyers, three sweeping mines and six in an offensive role, into Ofotfjord to neutralise a force of eight German destroyers trapped near the port of Narvik. Her Fairey Swordfish float-plane sank the German U-boat U-64 with 250 lb bombs, becoming the first aircraft to sink a U-boat in the war. The Swordfish continued to provide accurate spotting reports during the early afternoon which were, arguably, more important to the course of the battle than the Warspite's guns. 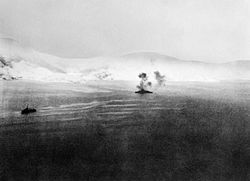 The British destroyers soon opened fire on their counterparts, which had almost exhausted their fuel and ammunition following the First Naval Battle of Narvik. All were sunk during the action. Warspite destroyed the heavily-damaged Z13 Erich Koellner with broadsides, while damaging Z17 Diether von Roeder and Z12 Erich Giese. Diether von Roeder had to be scuttled while Erich Giese was sunk in conjunction with destroyers. Although the Second Naval Battle of Narvik was considered a success, Warspite was lucky to escape unscathed given the number of submarines and other torpedo-armed enemy warships present in the narrow confines of the Norwegian fjords. She remained in Norwegian waters, participating in several shore bombardments around Narvik on 24 April, but these proved ineffectual and she returned to Scapa Flow prior to being redeployed to the Merranean on 28 April. The Battle of Cape Matapan had a paralysing effect on the Regia Marina, providing the Royal Navy with an opportunity to tighten its grip on the Merranean, as evidenced by the unequal battle near the Kerkennah Islands on 16 April. However, this was not enough and the continuing success of the Afrika Korps in North Africa induced Churchill to order a desperate attack on Tripoli to entirely block the Axis supply route by sinking one of the battleships in the harbour. Cunningham rejected this plan, but on 21 April he sailed with Warspite to bombard the harbour in company with Barham and Valiant, the cruiser Gloucester and several destroyers. The raid was ineffectual, partly because of poor visibility created by dust from an earlier RAF bombing raid, but the fleet returned to Alexandria without suffering any damage. The futility of the mission and the exposure of his battleships led to a tense exchange of letters between Cunningham and Churchill. Admiralty Historical Section (2002). The Royal Navy and the Merranean. Whitehall histories., Naval Staff histories. Vol. 2, November 1940 – December 1941. London: Whitehall History in association with Frank Cass. ISBN 0-7146-5205-9.